Happy Wednesday! Hope you all are having a blessed week. It's time for a new challenge at The Perfect Sentiment. 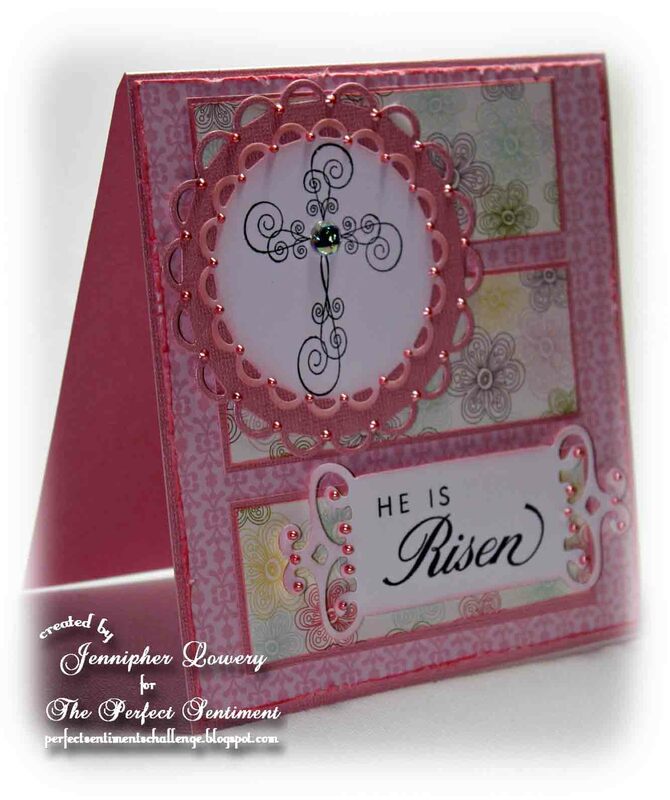 This week we are challenging you to create a card with a sentiment for Easter and add some bling to it. Our sponsor is Robyn's Fetish Digital Stamps and More. I created my card base with a sheet of Bazzill Bling cardstock. Does anyone remember that? I have a ton of it it that I have been hoarding. My patterned papers are from Echo Park's Springtime collection. I distressed the edge of the base layer and inked it with Spun Sugar Distress Ink. My cross and sentiment are from Verve Stamps. I used liquid pearls for my bling along with one rhinestone in the center of the cross. So very elegant, Jenn! The pastel pink combined with the bling and the "dainty" image. This is a beauty! Wonderfully made Jenn!! I may have to get over to Verve and see what they have!! I love Bazzill paper, I've got a stash big enough for an army and am proud to say that I have hoarded it!! lol! gorgeous! l love all the inked edges! Very pretty! 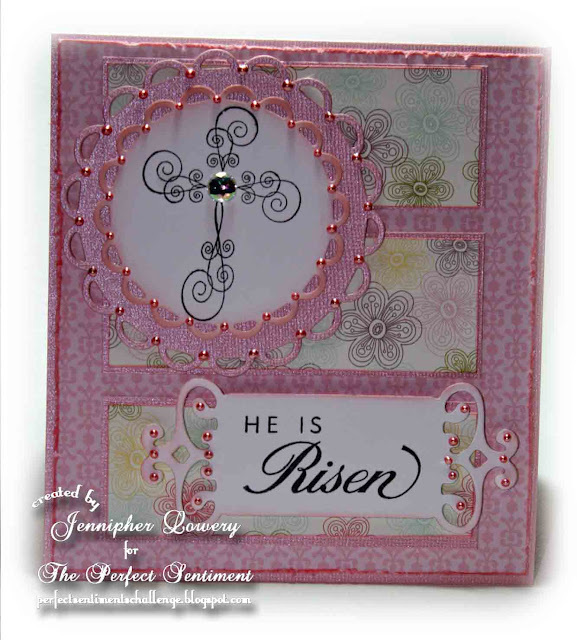 A very pretty Easter card, I love the look of the liquid pearls! Oh my, this is stunning Jennipher! I love that Bazzill bling, and have a few sheets left. The liquid pearls you added are wonderful; how do you get them so uniform? Beautiful! Love all of the pearls and the double matted cross! This is just beautiful! I think I still have a few sheets of that paper that I am hoarding--I am saving for the right project. Again, this is just beautiful! What a beautiful and elegant card. Love the pearls. This is truly a beautiful card Jenn!!! The sentiment is so true!! Perfectly lovely card, Jenn. That cross is so pretty! I love the double layered scallops and all the pearls around them. Beautiful! Such a beautiful Easter card, and I love all the bling you added! Don't you just adore that Echo Park dsp? So pretty! I just love your card Jenn. The colors are so pretty an the papers and image are so pretty. Thank you SO much for sharing in our linky party at Make It Monday and for joining in the challenge at Top Tip Tuesday. Beautiful bling, beautiful card Jennipher! Thank you for stopping by to visit. Your Easter card is gorgeous with all that bling. Lacey circles are one of my favorites! Jennipher girl what an awesome card you have here. I love it! Must stop by here more often! Beautiful, Beautiful! Very beautiful Easter card. Lovely paper and the bling is perfect! So glad you joined us this week at Stamptacular Sunday Challenge! Gorgeous and elegant! This is beautiful with the image and sentiment and how you did the dies with the bling. Have a wonderful weekend. Stunning. Everything is perfect. Thanks for sharing with us at Incy Wincy , and hope to see you back next week. What a great card! That cross is just so delicate and the sentiment is just perfect! Such a great card. Thanks for joining us at ATSC. Just Gorgeous! Fabulous colours. LOve your pearls and the rhinestone looks soooo pretty in the centre. This card is breathtaking! Love the colors and layout with all the bling and pearls. I can't imagine how long it took to place each pearl-but it turned out beautiful! You are such a talented lady.